This Is not the Israel trip Mike Pence had planned. Vice President Mike Pence will be accorded a hero’s welcome when he lands at Ben-Gurion Airport on Sunday night, but for Palestinians he is more of a villain, or at least his deputy. Pence will receive an unusually warm embrace from Prime Minister Benjamin Netanyahu and his government, but will be shown an ice-cold shoulder by Palestinian Authority President Mahmoud Abbas and the Palestinians. In Jerusalem, Pence is seen as playing a central role in the positive change in America’s Middle East policies, but in Ramallah and other Arab capitals, he is recognized as one of the prime movers behind U.S. President Donald Trump’s decision to betray the Palestinians with his one-sided decision to recognize Jerusalem as Israel’s capital. 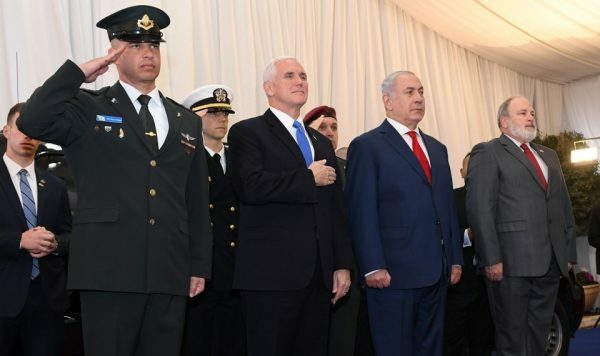 Pence’s visit, even more so than Trump’s in May, symbolizes the new alliance – words that in Hebrew are identical to New Testament – between the right-wing governments in Israel and the U.S. and authoritarian Sunni countries such as Egypt and Saudi Arabia. The Palestinians believe, not without a few valid reasons, that the new Middle Eastern power axis is being built on their backs and cemented at their expense. Unlike Pence, Trump is only a temporary member in the legions of Israel’s admirers. If and when Jerusalem dares challenge or insult him, it could easily find itself consigned by presidential tweets to the list of “shithole countries.” Pence, on the other hand, is a true believer, the real deal, a messianic Evangelical whose faith compels him to unequivocally support Israel and its most maximalist demands, up to and including, if the need ever arises, full annexation of the Jews’ biblical homeland in Judea and Samaria. Even without the benefit of listening devices, one can rest assured that when Netanyahu and his cohorts contemplate the theoretical impeachment of Trump, they do not break out in cries of desperation nor do they appeal to the almighty to prevent such a catastrophe from occurring. Pence postponed his original visit, scheduled for late December, because his vote may have been needed to break a Senate tie over tax reform, which was ultimately approved without him. He was allowed to depart to the Middle East in the midst of the latest crisis because he can do nothing to help Republicans get the 60 votes needed to break a filibuster and avert a federal government shutdown. Nonetheless, instead of arriving with the passage of tax reform and the high point of Trump’s achievements in his first year in office behind him, Pence comes to the Middle East as the Sancho Pancho of a president who bills himself as the world’s greatest deal maker, among other things, but who couldn’t even broker the relatively simple deal needed to keep his own government going. And on his first anniversary yet, to Trump’s great embarrassment. The warring sides in Washington are now engaged in the blame game, trying to pin responsibility for the shutdown fiasco, as long as it lasts, solely on each other. Polls indicate that more Americans blame Trump and the GOP, who control the White House and both Houses of Congress, though their “base” is convinced, of course, that it’s all the Democrats’ fault. Experience gained from previous shutdowns – the last was in 2013 under former U.S. President Barack Obama – indicates that most Americans end up believing both sides, or “a plague on both your houses,” as Mercutio puts it in Romeo and Juliet. Previous shutdowns had very little economic or political fallout, though they do tend to feed the kind of popular outrage at everything and everyone in Washington that Trump exploited on his way to the White House, but for which he is now being held responsible. The bitter battle over the shutdown is mainly indicative of the increasingly radical polarization of American politics. The “base,” on both sides now, is running the show. The Republican base’s fierce hostility toward Obama drove the GOP to break the rules of the game and to avoid collaboration in Congress at literally any cost, come what may. The energized Democratic base detests Trump no less passionately, deterring any rational party representative from even thinking of compromising with him instead of scoring points against him. And just as whatever Obama held dear immediately turned abominable in the eyes of his haters, anything that Trump – and by extension, his often embarrassingly kowtowing vice president – happens to covet immediately transforms into the devil’s spawn in the eyes of devoted anti-Trumpers. Pence’s visit, in this regard, will drive another nail into the coffin of the once-warm ties between Israel and most American liberals. In Israeli eyes, Pence is a true friend who comes with the added bonus of positions on the Israeli-Palestinian conflict that place him somewhere on the right of Likud. In Palestinian eyes, he symbolizes the unholy fusion of Christian messianic beliefs with Jewish political influence. In the eyes of many American liberals, Pence is the worst of all worlds: a radical reactionary who fights abortions and gay marriage; a religious fundamentalist who wants to foist church on state; a cynical politician who wants to endear himself to party faithful by being the servile chief-enabler of the base’s populist boss. For many secular Americans, Pence is the high commissioner of holier-than-thou Evangelicals who turn a blind eye to Trump’s unending sins and transgressions because he is advancing their social and religious agenda, including unyielding support for Israel in an effort to advance the End of Days. Israelis are all too familiar with supposedly righteous rabbis who have absolved Netanyahu of all present and future crimes for the sake of the Land of Israel, as well as with religious fundamentalists who wish to impose their values on an unbelieving population no matter what. Pence’s visit, more so than Trump’s, offers a distilled view of the triumph of the fundamentalist-nationalist conversation that now dominates both Israel and the United States and its emergence as the essential crux of the relationship between the two countries. Like everything he’s involved in, Trump’s visit to Israel was mainly about Trump and the general suspense whether he’d say or tweet something embarrassing or inflammatory that would create a scandal and change the narrative of his stay. Pence is almost the exact opposite. The former Indiana governor is cautious to the point of perpetual boredom and hardly ever says anything that is retained in memory for more than five minutes, unless it’s something that induces nausea like the vice president’s occasional blessings for the divine gift that is Trump. Trump, you will recall, did visit the Palestinians and was received with proper pomp and fanfare, though his talks with them, it later emerged, were harsh and acrimonious. Pence, on the other hand, is persona non grata from the outset, both for his personal views and as a representative of the perfidious president he serves. Even if there is an actual peace plan about to be presented by Trump and even if it does contain formulations that Netanyahu would ostensibly be uncomfortable with, Pence is not the man and Trump’s is not the plan that can persuade the Palestinians to stop smoldering and to start treating the U.S. as reasonably honest brokers anytime in the near future. Pence’s visit highlights the underpinnings of the current honeymoon between Netanyahu’s Israel and Trump-dominated and Pence-influenced United States. These include: A united front against Iran and against radical Islam – in its loosest definition – along with full-throated support for the president who takes them on; a joint effort to lower the expectations of Palestinians to a bare minimum – if not to extinguish them altogether – and concurrently bully international organizations that support them; the deployment of Evangelicals as Israel’s weapon of choice in exerting its influence in Washington, at the expense, by definition, of the pro-Israel lobby AIPAC, which is too tame and bipartisan in the eyes of some decision makers and their whisperers, including Sheldon Adelson; and most of all, a wide array of deeply shared values including hyper-nationalism, a cult of personality, hatred of the media, denial of the rule of law, an ongoing culture war against decadent secular and liberal values and an earnest belief in what they describe as the Judeo-Christian Western civilization as superior to all the rest. True, the visit also marks the ongoing excellent relations between the people of Israel and the people for the United States, which should make any Israel-loving Zionist proud, but for those who don’t share the common beliefs that bind Trump, Pence, Netanyahu and, let’s say, Habayit Hayehudi leader Naftali Bennet together, Pence’s historic visit is bound to leave a bitter-sour taste in their mouths. Many tried before Peance/Trump to negotiate a peace agreement and failed – why should it be successful this time with the clumsy approach from Trump? Several wars, insurgencies and terrorism didn’t work. Various diplomatic efforts didn’t work. So now Abbas gets a swift kick in the rear cheeks. Why not. Indecent behavior of the Arab members of the Israeli parliament. They would get more attention through total absence from the meeting. Now Donald Trump has accused Palestinian leaders of disrespecting the US by refusing to meet with Vice President Mike Pence in Jerusalem this week. He will withhold Palestinian aid unless they return to negotiating table…..
Trump’s comments came after talks with Benjamin Netanyahu at Davos. Upon his arrival in Davos, the US President assured that he wants a stronger dollar exchange rate. “The dollar is getting stronger and stronger and in the end I want to see a strong dollar,” said Trump in an interview with CNBC. Trump corrected comments made by his Finance Minister, Steven Mnuchin, who had caused a stir in Davos and continued to slump the dollar. “Obviously, a weaker dollar is good for us.” A weaker dollar is “good, because it has to do with trade and opportunities.” said Mnuchin. Mnuchin’s point was that if the dollar fell, US products would become cheaper on the world market. ???? His remarks were interpreted as a possible departure from traditional US government practice, not to bad-temper their own currency. Trump said, however, that the statements of the Minister of Finance had been “taken out of context”. ??? ?